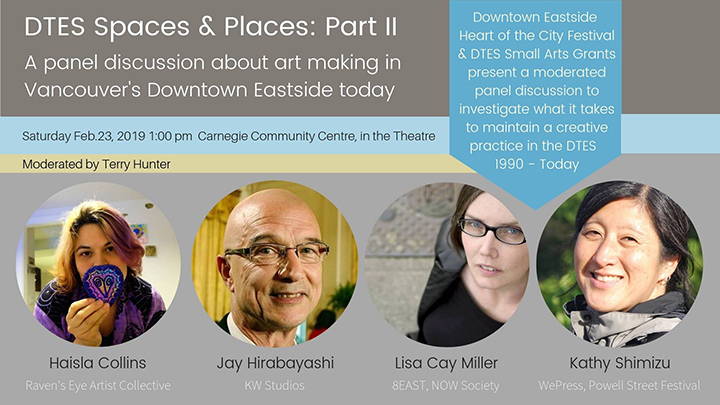 This panel, moderated by Terry Hunter (Artistic Producer, Heart of the City Festival), will explore the reality of art making in Vancouver’s Downtown Eastside (DTES) from 1990 - Present Day. This is the second of three discussions about creative spaces + places in the Downtown Eastside (DTES). This program is a co-presentation of the Downtown Eastside Heart of the City Festival and the DTES Small Arts Grant Program and is generously supported by Carnegie Community Centre.